Go BIG, or go home! Isn't that what they say in Texas? Well we like to do things big here too in California. Those days that are extra hot we find creative ways to play in the house where it's nice and cool. My four year old girl is very creative when it comes to making forts, and playground type obstacles in our living room. The inspiration for this pillow came from her. Watching her stack every decor, and bed pillow in a huge pile, and then jumping on it was just about the best thing she could think of. That's when I decided to fix two small problems in the house. 1. give her a giant reading pillow (or something BIG to jump on) And 2. maybe even a place for storing stuff like those extra guest pillows. rainbow scraps solids or prints it doesn't matter. Even a FQ bundle would work. If you like to baste your hexagons by hand the glue pen is not needed. However the basting glue method is pretty fast to get through. The left side is basted by hand, and the right side is the sewline glue pen basting method. This photo is just to show the difference do not remove your papers until you are finished. This makes it easier to hand sew them together. 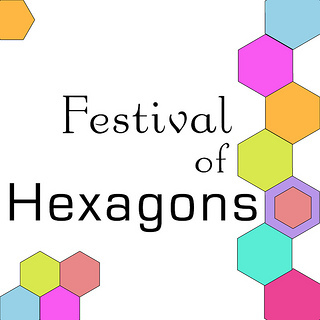 How many Hexagons should you make? I use a ladder stitch, but whatever works for you is fine. Some people really like the whipstitch for hand piecing. Use these 3 hexagons as the basis for your pillow shape. See this diagram for an example. After you have all your pieces hand sewn down, I like to take a quick iron over them to press the ends down before I remove the papers. After you get a nice press you can then remove all the paper pieces from the pillow cover. After you have removed the paper, lay the pillow on your choice of back round (I choose Kona in snow. This piece is basically only to reinforce the hand sewing so that it can be used without it falling apart. I choose a matching thread for each color and added it to my top stitch, leaving the bobbin thread white. It's a little hard to see in the photo, but I stitched down each color row of hexagons to the white back round. This is what reinforces the hand sewing. I added an envelope style back, but you can certainly do a zipper. I in fact ordered one to replace my back later. If you do an envelope back, make sure to make the flaps overlap a little more then you would for a smaller pillow. Pillow measures approx 42" x 42"
Don't forget to check out all the other tutorials in the festival of Hexagons. Join the flickr group here to share your projects and win prizes! You are such a rockstar, I LOVE This!!! Thanks Ali, for inviting me to the festival of hexies this was fun! Gorgeous! I'm tempted to make one for my dog since it's so much cuter than the monstrosity of a dog bed she currently has. This is a cute idea for a floor pillow. I love this! Rainbows are just my thing and I love that the whole pillow is a hexagon too. So unique and great idea for storing spare pillows, they take up so much room otherwise! What a wonderful thing....bright, hexie pillow. that is sew fantastic!!!! What a clever idea!! Thank you for the post and for the links! Wat a great idea. Looks lovely and it's very practical. Fabulous,and the instructions are so clear and well explained.Thanks. What a great idea for some extra storage and a beautiful accent piece as well. Nicely done! So fab,and fun, and bright. I think this could become a must for 12 year old to read on. A great tutorial Terri. I think I'd try stuffing it with bean bag pellets. A great floor pillow for kids and dogs! This is so awesome, one day I'll find the time.... I hope! Wow! This is so cool and a great idea! Thanks for sharing! Cute! Kid friendly and kid approved. Oh, wow, awesome way to make a huge pillow. Love, love this idea. I have a 2 year old granddaughter who would love to snuggle up in this. Thank you so much for the tutorial. 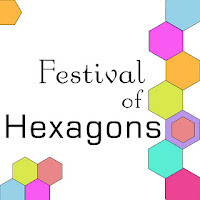 I don't usually like hexagons but I love that and I think my two grandsons (aged 30 months and 14 months) would too! That cushion is fabulous! Great colours too! I am a hexagon fan big time and when I found your tutorial I was thrilled. Thank you so much for a fantastic tute and for another reason to love hexagons. I LOVE THIS! I am totally making this pillow.